SoftPlanet makes it possible for everyone to get free Agnitum Outpost Antivirus Pro download directly from our servers. There is no registration needed for downloading. 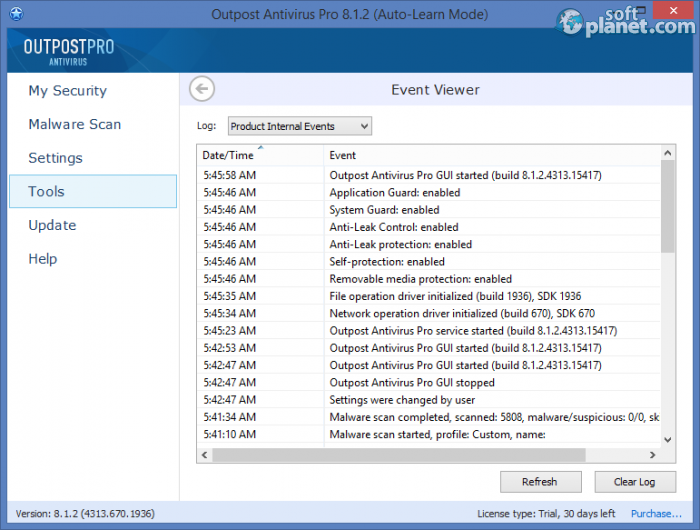 Agnitum Outpost Antivirus Pro 9.0 Build 4537.670.1937 is the latest version of this software, which comes with several bug fixes and a few new features. For instance, it can install and run an on-demand malware scanner in Windows Safe Mode. Agnitum Outpost Antivirus Pro 9.0 uses a new URL processing algorithm to protect users against accessing fraudulent websites, and increases its knowledgebase of bad sites, thanks to regular updates. 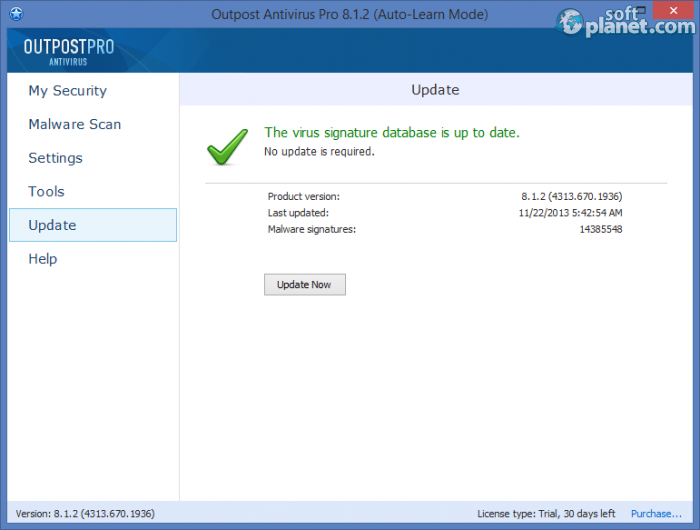 It can be installed on an infected system, detect and remove malware during installation. This software is able to perform three different types of scanning process – Quick, Custom or Full System Scan. The custom one enables you to include file extensions and in-depth heuristics, skip small-sized files, include multiple objects like boot sectors, startup entries and even running processes, etc. Agnitum Outpost Antivirus Pro 9.0 comes with a quarantine as well, which can restore or remove the threats found permanently. The utility comes with self-protection, auto-learn and entertainment modes, a real-time shield and email scanner, etc. The list of available features is really impressive. The interface of Agnitum Outpost Antivirus Pro 9 looks pretty good. I like it as most users would I suppose. It is very refined, well-organized and classy. You are provided with navigation within the side bar of the main window, which really facilitates the workflow of the program and makes it very simple to work with. In my opinion the button reaction could be a bit sharper. Despite this tiny detail Agnitum Outpost Antivirus Pro 9.0 Build 4537.670.1937 works just perfectly. I could not find a single bug during the entire test. Like most security applications it sits in the system tray most of the time. Thus it won't interrupt you during you work. I really like the News section within the main window. It is something that couldn't be found anywhere. It will keep you posted for the latest innovation and news about Agnitum. The application itself works very smoothly. However it doesn't seem to be the fastest one, but it really does a proper job, not just pretending to. Even when i ran the Quick System Scan, it takes lots of time to finish the process. However when you see how many files, folders and registry entries it has scanned you will understand why the process takes that much time. Even when I installed the latest version of the software, it still needs to download some massive update definition packages from the server. Probably it will be a good idea to be implement them within the latest release of the software. This will save valuable users' time. Agnitum Outpost Antivirus Pro 9.0 is a proper software solution, designed to keep you safe against all kind of online malware attacks. Please do no hesitate share us your feedback regarding this software and its rank into the antivirus software category. 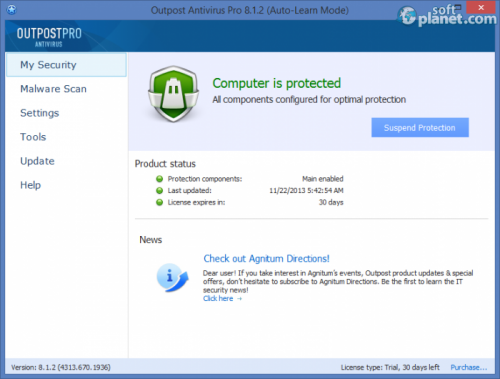 Agnitum Outpost Antivirus Pro is VIRUS-FREE! Our security scan shows that Agnitum Outpost Antivirus Pro is clean from viruses. The current version of Agnitum Outpost Antivirus Pro has been scanned by our system, which contains 46 different anti-virus algorithms. That ensures that Agnitum Outpost Antivirus Pro 9.0 Build 4537.6 is 100% safe for your computer. 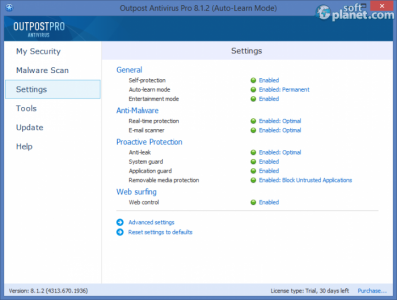 Agnitum Outpost Antivirus Pro 8.1.2 (4313.670.